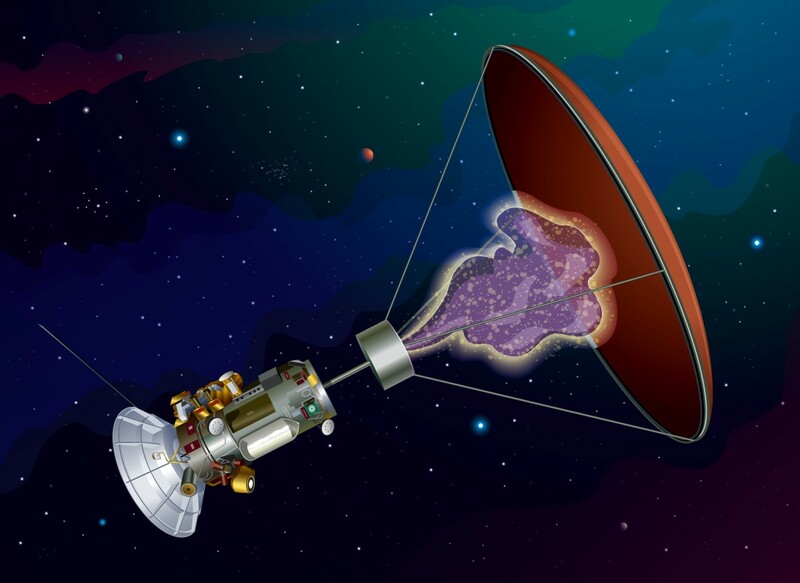 Dreams of antimatter space propulsion are closer to reality than most rocket scientists could ever imagine, says former Fermilab physicist Gerald Jackson. In fact, if money were no object, he says an antimatter-driven spacecraft prototype could be tested within a decade. To that end, next month, Jackson and his Chicago-based Hbar Technologies firm are launching a $200,000 Kickstarter campaign to crowdfund the next phase of its antimatter propulsion research. With propulsion velocities of some 40% of the speed of light, such technology could eventually cut travel times to the nearby Alpha Centauri star system to less than a decade. And more immediately, it would allow NASA to send a New Horizons-type probe to our outer solar system in a year or less. They want to use the antiproton as a spark plug to induce fission, explains Jackson. And from this fission, he says, emerges what nuclear physicists term lighter “fission daughter” byproducts. Each such antimatter annihilation releases two billion electron volts (2 GeV) of energy. Thus, an antimatter rocket, which would only be launched outside of Earth’s atmosphere, could provide a lot more thrust than a chemical or even nuclear rocket and use tens of thousands of times less fuel , says Jackson. As envisioned in Jackson and Howe’s original design, a small antimatter robotic probe would consist of four basic components: a depleted uranium-coated carbon sail; a solid antihydrogen storage unit; an antiproton-driven electrical power supply, and a small payload instrument package at the back of the spacecraft. Upon being struck by antihydrogen protons, a portion of the depleted uranium situated on coated foil inside the spacecraft is caused to fission. This creates two “fission daughter” byproducts which typically are emitted back-to-back with equal momentum. While the two daughters may not be exactly alike atomically, in order to adhere to known laws of physics, their momentum inherently must be equal, says Jackson. One fission daughter heads into the direction of the spacecraft’s uranium-coated carbon sail and is decelerated and absorbed; imparting its momentum into the sail. The other escapes into space in the form of conventional propellant exhaust. It’s the opposing forces of their powerful kinetic energies that enable the spacecraft to reach such high speeds. Jackson would like to take a portion of the initial $200,000 he and Stowe are seeking to build a device to measure such thrust. The biggest tech challenge says Jackson is the getting money to produce enough antiprotons to do the actual tests. Such antiprotons are usually generated in particle accelerators by aiming fast moving hydrogen atoms into a nickel target. “For every 100 protons that hit the target, there can be yields of up to one anti-proton,” said Jackson. When could an antimatter propulsion prototype be tested in space? If the money were there, we could do it in ten years, says Jackson, noting that it would take a $100 million to design an Earth-based technology test. “But you’re talking billions to send spacecraft out to real destinations,” said Jackson. But he says if the will is there, spacecraft capable of cruising along at 40% of lightspeed should be achievable within the next two to three decades.